In a bunch of my paragraphs for the Classic Serials, I've talked about how Terry Nation planned to take the Daleks to America for their own TV show. That never happened. Apparently Big Finish got ahold of their pilot script and adapted it into an audio drama. Also it stars Sara Kingdom from The Daleks' Master Plan. This sounds wild. I gotta listen to this. 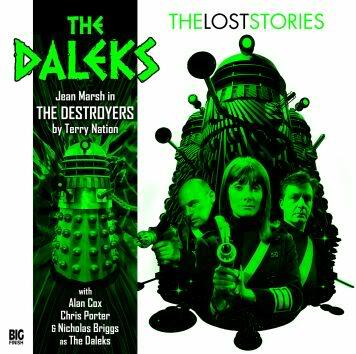 Here's an actual synopsis: "When the crew of Explorer Base One is attacked by the Daleks, Space Security Agents Sara Kingdom, Mark Seven and Jason Corey are sent to investigate. They discover a plan that threatens the future of the entire galaxy…"
This is available to buy on BigFinish.com as part of The Second Doctor Boxset. What did you think of this? Could it actually be a TV series? Would the Daleks just be threatening the galaxy every week? Wouldn't that get old? I can't really see this working as a TV show. The production would have to be ambitious, but it really relied on an already established interest in the series. None of the characters, even Sara Kingdom, were that easy to invest in. Mostly because they rarely spoke. It was mostly the (well acted) narrator. I know this was developed before Dalek Empire, but this now retroactively seems like a pale comparison. Oh well. We need some more Sara Kingdom because she's awesome.